I made this and followed the recipe to the letter , except for cooking a pound of dried black Beans in my trusty pressure cooker for 20 minutes. This burger is to die for. I made 5 pounds of the burger mix and rolled it into a log. I wrapped it in plastic wrap and chilled it overnight. It was even better the next day. the flavors had nicely melded and all I had to do was slice a "wheel" of B.B.O.B. off the log and cook it in a skillet with a teaspoon of olive oil, with the skillet covered with a lid. 5 minutes per side with the heat set on medium and it's good to go. I like the way Keeliey made a big batch. Can you make the patties and freeze before cooking to take out as needed? Yes, You can make a huge batch of black bean veggie burger mix. I suggest that once you get the mixture made, you make all your patties and wrap each one in plastic wrap and place in a large zip lock bag. You can also make all your patties and cut squares of waxed paper and place them between each pattie and then wrap the pattie stacks in plastic wrap prior to putting the wrapped burger stacks in a large zip lock bag. 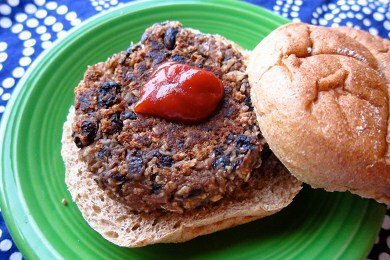 The ingredients for black bean veggie burgers are endless. I have tons of recipes. Eventually, I will start my own YouTube channel. I am a retired Chef/Caterer and am dying to pass on my vegan cooking techniques. I can't have oats / rice carbs of this sort - any other ideas for making this? The link to the Lentil Chipotle Burger seems to be broken.